Idaho is neighbored by Montana, Wyoming, Nevada, Washington, Oregon and Canada. The majority of land in Idaho is not inhabited by people. It’s no wonder why Idaho has a very low population compared to other states in the U.S., so much of it is simply inaccessible. The capital and largest city in Idaho is Boise. The Boise Metropolitan area, which consists of Boise, Nampa, and Meridian, makes up forty percent of the population. This area is located in Idaho’s southwest corner and makes a great location for Idaho auto shipping. In fact, if you are shipping a car to Idaho, then it’s probably happening in the southern part. Idaho is a mostly rugged state as mountain ranges take up most of the area. Borah Peak, a part of the Lost River Range, is the highest point in Idaho at 12,662 ft. In Lewiston, Idaho, you can find the lowest point at 710 ft. The Yellow Stone National Park also stretches into Idaho. Along with mountains, Idaho has multiple caves, rivers and water falls. 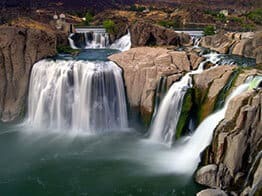 The drop of Shoshone Falls (see photo) surpasses the depth of Niagara Falls. Idaho is also the home to North America’s deepest river gorge, Hell’s Canyon, at 7,900 ft. In the lower central part of Idaho is The Snake River Plain. Here, visitors and residents can see The Caters of the Moon National Monument and Preserve. The ground here was formed by previous volcanic activity. Auto transport drivers most likely will not have to deliver cars in this area as not much travel goes through that area. There is only one road that stretches across it. There are actually a few different ways that auto shippers can get into and out of Idaho, though it depends heavily on where you are auto shipping in Idaho. Boise is serviced by I-84, a smaller east-west interstate that runs from Portland, Oregon to Salt Lake City, Utah, by way of southwestern and southern Idaho. While I-84 is considered a primary interstate of the Interstate Highway System, it’s not all that popular with car transporters as there’s no real major metro areas in between Portland and Salt Lake City besides Boise, and with no other connects to major interstates along I-84 it’s fairly isolated, all things considered. This makes it more expensive to run auto transport routes along that corridor. Sometimes auto transport customers don’t understand that running carriers into isolated or remote areas is very costly. In addition to potatoes, Idaho also contributes to the production of various chemical products, electronics, lumber and wheat. Idaho is known for its renewable energy systems as well. Hydroelectric power makes up three quarters of Idaho’s power supply. Idaho is also known as The Gem State because nearly every gemstone can be found here including diamonds. In fact, the largest diamonds found in America are located in Idaho. Though Idaho is not commonly thought of as a vacation spot, this scarcely populated state is a great place to enjoy nature on a large scale. Whether you are flying in for vacation or for relocation purposes, you will definitely want to have your personal vehicle shipped to you. You will be glad that you decided to contact an Idaho auto shipping company such as ours. Using car transport services surely comes with benefits. You can spare an extensive road trip, avoid having to tow an extra car around and preserve the condition of your vehicle by shipping it instead. You can count on a top quality auto shipping service like Direct Express to deliver your car right to you. If you’re thinking about using our auto transport services or want to learn more about vehicle shipping to or from Idaho, feel free to contact us by calling our toll free number (800-600-3750). You’ll be able to speak with an auto transport customer service representative about how auto transporting works. You can also visit Direct Express Auto Transport to fill out a simple form and get a free car shipping quote. We make it easy to book your vehicle shipment online.